View of “Karen Kraven,” 2014. 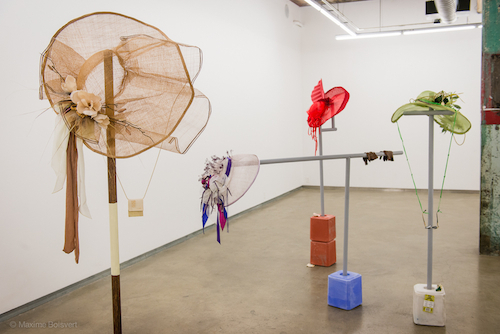 The title of Karen Kraven’s first institutional solo exhibition, “Razzle Dazzle Sis Boom Bah,” signals the Montreal-based artist’s infectious enthusiasm for mimicry, subterfuge, and speculation across a new body of work comprising sculpture, photography, and ceramics. Like a modern-day incantation, the phrase begs to be spoken aloud, evoking the shimmering strands of cheerleaders’ pom-poms and the emphatic sounds of exploding fireworks. Such exuberance is everywhere on display here, including in a series where six elaborately decorated women’s hats made of delicate straw latticing are perched atop wooden dowels supported by salt licks—the centerpiece of this show. Resembling accessories worn at a racetrack, one is titled Lady’s Secret (all works 2014), while others have titles taken from racehorses’ names, such as Youcan’tcatchme and Rags to Riches, embellished with an unlikely combination of natural and dollar-store materials including dead flies, porcupine quills, dried grass, plastic earphones, and pantyhose. Betting tickets and humorously oversized ceramic versions of folded bills are strewn around the bases of the hatstands or hung from a badminton-net canopy above, completing the tableaux. Nearby, five colored photographs offer a quieter meditation on the aesthetics of currency. For these, Kraven scanned the intricate background patterns printed onto Canadian paper money to prevent duplication and forgery, then she enlarged and overlaid each denomination’s designs to further abstract their formal qualities. These replications, among the other stand-ins of value throughout the show, point to an increasing distance between the surface appearance of things and their substance, a subtle commentary on the abstract concepts that underpin economic speculation’s arrestingly real effects.